A huge 14.5 metre long and 12 metre wide petroglyph depicting an elephant and other animals in Konkan, Maharashtra, India. 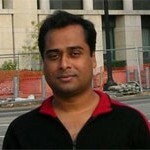 Note from the editor: Right-click on the image links to view images in new tabs and avoid interruption. 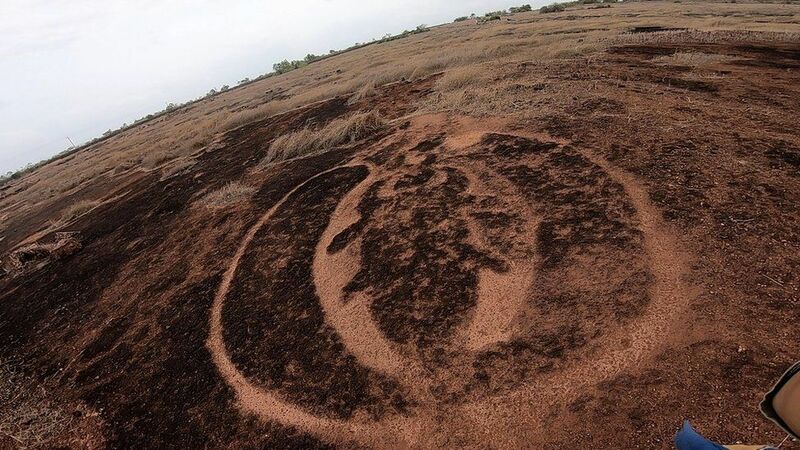 “Our first deduction from examining these petroglyphs is that they were created around 10,000 BC,” Director of the Maharashtra State Archaeology Department, Tejas Garge, told the BBC. In other archaeological sites, the petroglyph style of art is associated with tools from the Mesolithic period. Mesolithic tools have also been found at a petroglyph site in the village of Kasheli in Ratnagiri.2 This puts the date of creation of these rock carved images at the very beginning of the post-glacial period, when humanity had just emerged from the cataclysms of the Younger Dryas epoch. While some of the petroglyphs were known to the locals who treated them with reverence, most of them were hidden beneath layers of mud and soil deposited during the intervening millennia. The 52 sites where the petroglyphs lie have been identified over the past 6 years or so by a group of explorers led by Sudhir Risbood and Manoj Marathe, who have a deep interest in the history, architecture, flora and fauna of the Konkan region. 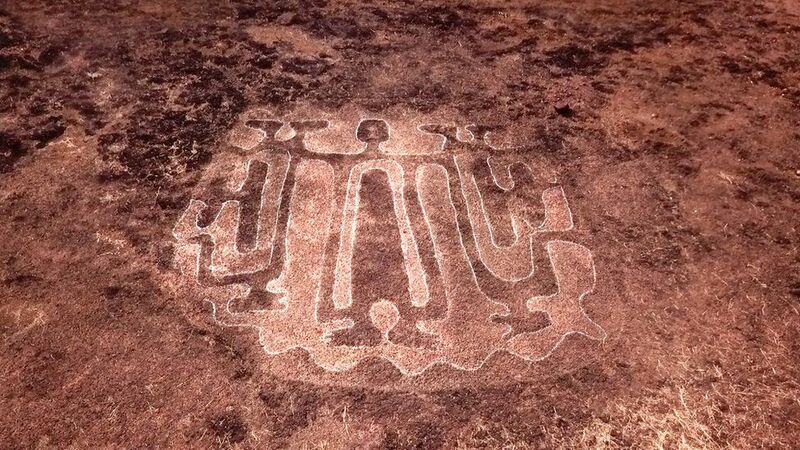 Many of the petroglyphs are not rudimentary scratches on the ground but large carvings executed with a lot of detail. Tejas Garge told the BBC that they might have been created by hunter-gatherer tribes, on account of the numerous images that depict animals, birds and sea creatures.3 However, the petroglyphs also include complex geometric forms and intriguing human figures, whose meanings remain unclear. When I looked at the images in the BBC News report and then in a video on the BBC News Marathi TV channel,4 I was astonished to see sacred symbols found in the art and culture of many civilisations. Let’s take a look at them and reflect on their significance and implications. One large petroglyph depicts the Winged Scarab, a popular ancient Egyptian symbol associated with creation and rebirth. The visual similarity between the petroglyph and the ancient Egyptian symbol of the Winged Scarab is quite striking. In the aerial view of the petroglyph we can clearly discern all the features of the Winged Scarab, including the sun-disk. 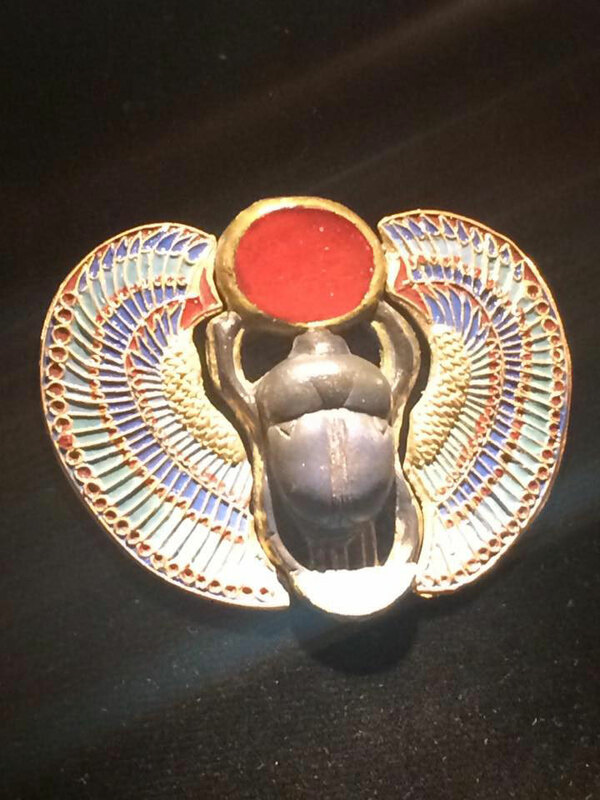 It boggles the mind to think that the Winged Scarab symbol, which was so popular in ancient Egypt, has been existence since the very beginning of the post-glacial epoch. How did such esoteric concepts and symbolic imagery appear at such an early age? Is it possible that the Winged Scarab symbol encodes the cosmic wisdom of an erstwhile “Golden Age” civilisation that perished during the cataclysms of the Younger Dryas period (10,900 BCE – 9700 BCE) when our planet was struck by multiple fragments of a giant comet? It is now well known that a Younger Dryas cosmic impact initiated a vicious cold snap, accompanied by fires, floods, and black rain, which brought about the extinction of a large number of North American megafauna and a North American prehistoric culture.7 Around 9703 BCE, the cold snap ended as abruptly as it had started, for reasons not clearly understood.8 The sudden transition out of the Ice Age to a warm interglacial climate may have precipitated a global flood of mythic proportions, which is recounted in the flood legends of many ancient cultures. 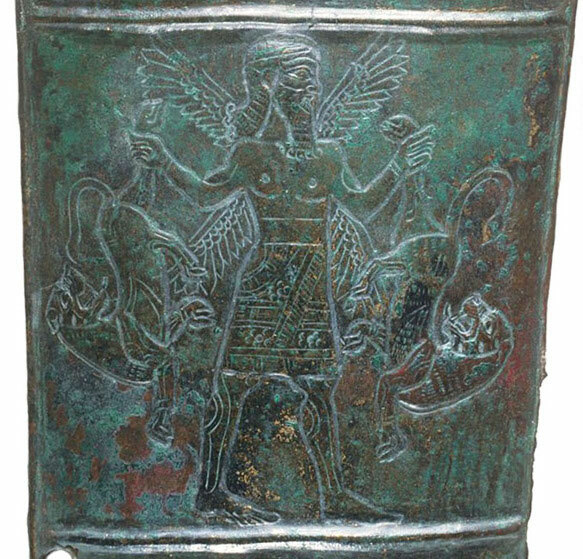 5: c. 9th or 8th century BC bronze quiver cover from Mesopotamia/western Iran, featuring the Master of Animals. Courtesy of the Metropolitan Museum of Art, New York. CC0 1.0. 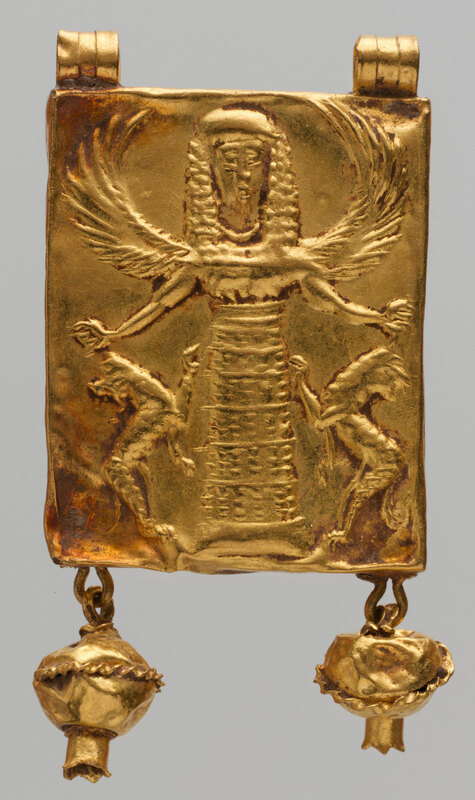 6: c. 7th century BC gold pendant from Greece, depicting the Mistress of Animals. Courtesy of the Metropolitan Museum of Art, New York. CC0 1.0. Similar scenes of dominance over animals can be seen on Mesopotamian cylinder seals, where the tiger is replaced by lions. 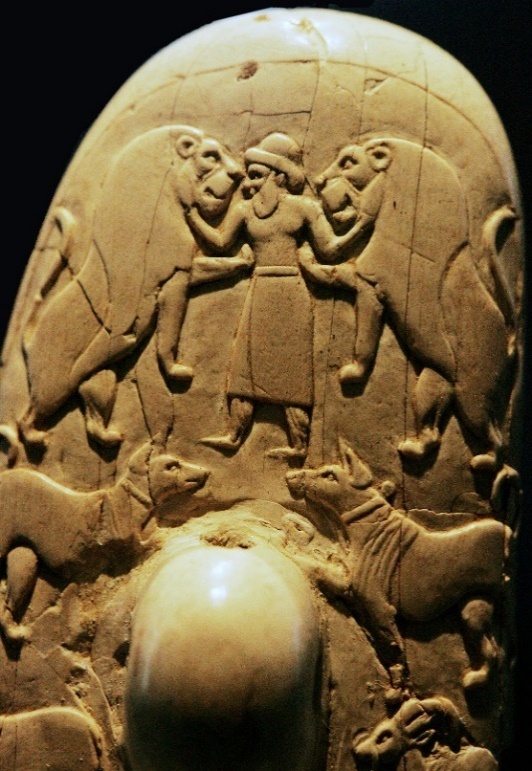 One of the earliest representations of the Master of Animals grasping a pair of lions appears on the Gebel el-Arak knife that dates back to c.3450 BCE, which was the beginning of the Naqada II period of Egyptian prehistory. The different depictions of the Master of Animals symbol seem to exude a sense of enormous physical strength and courage. Perhaps, this was an ancient icon of superhuman strength, used in the context of gods, heroes, or kings. Another intriguing petroglyph discovered at Ratnagiri depicts a pair of fish facing opposite directions, connected by a strap or band. 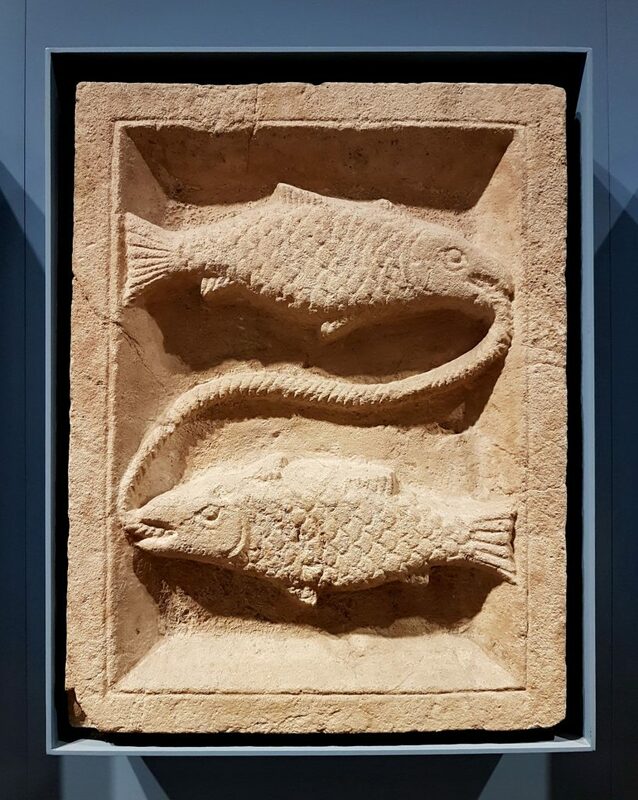 This symbol has been used for millennia to depict the Pisces constellation. 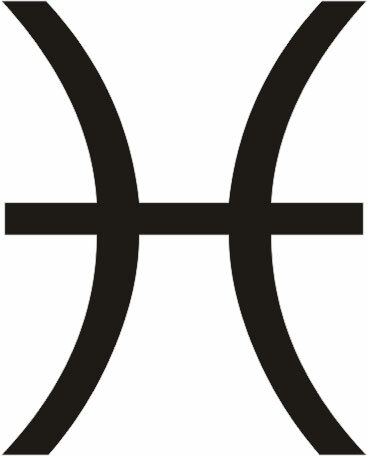 The Pisces astrological symbol consists of a pair of fish swimming in opposite directions, with a chord or band connecting the two fish, so that they remain together. The modern glyph for Pisces can be seen to derive directly from this 12,000-year-old petroglyph. As per current wisdom, Pisces is one of the earliest zodiac signs on record, appearing on an Egyptian coffin lid from c. 2300 BCE.13 However, the discovery of this 12,000-year-old petroglyph pushes back the date for the origin of astrological symbols to the period around 10,000 BCE or earlier, and raises the possibility that our astrological knowledge is a legacy of a lost civilisation that flourished during the Ice Age. This petroglyph shows a man holding an object above his head with both hands, looking similar to Aquarius, the water bearer, who pours out a stream of water from a water jar held above their head (or on the shoulder). Aquarius is located in a region of the sky called the Sea, and early stargazers associated the star patterns here with fish swimming in the celestial Sea.14 To the right of the person (on the left side of the image) we see a pair of fish, which have been depicted at the exact position occupied by the zodiac sign of Pisces the fish. Another pair of fish can be seen near the left leg of the person, corresponding to the position of the constellation Piscis Austrinus, the southern fish. What we seem to have here is an astonishing sky chart etched on the ground, depicting the constellations of Aquarius the water bearer, bounded by Pisces the fish and Piscis Austrinus the southern fish. 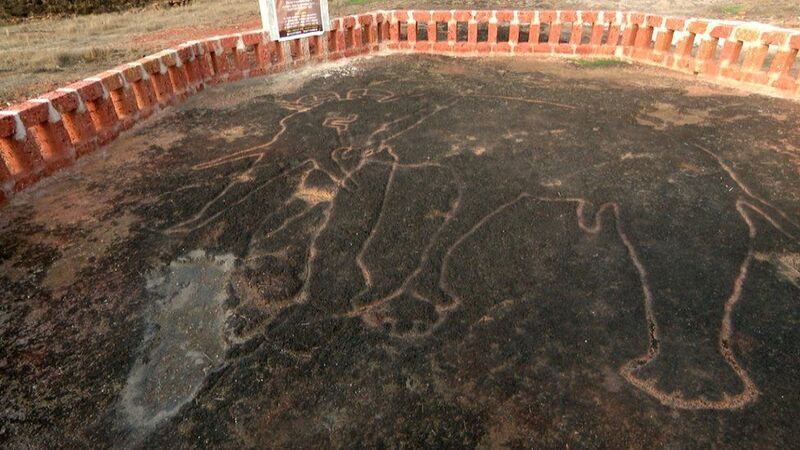 While there may be additional petroglyphs in the Ratnagiri area that depict other signs of the zodiac, it is a curious coincidence that the first two constellations that caught my eye were those of Pisces the fish and Aquarius the water bearer. According to the doctrine of the astrological ages, we are currently in the age of Pisces, and are about to transition into the age of Aquarius. The very fact that the petroglyphs of Ratnagiri have been dated to c.10,000 BCE, when humanity had just emerged from the terrible devastation of the Younger Dryas epoch, suggests that these symbols may not have been devised by the people who carved them. Rather, they might encapsulate the esoteric wisdom of an advanced civilisation that flourished during the Ice Age, and perished during the Younger Dryas cataclysms. The survivors of this “lost civilisation” would have settled at many places around the globe, one place being the Konkan coast of India. Here, they etched their sacred symbols on the hard, rocky landscape, which could have transformed into open-air altars. 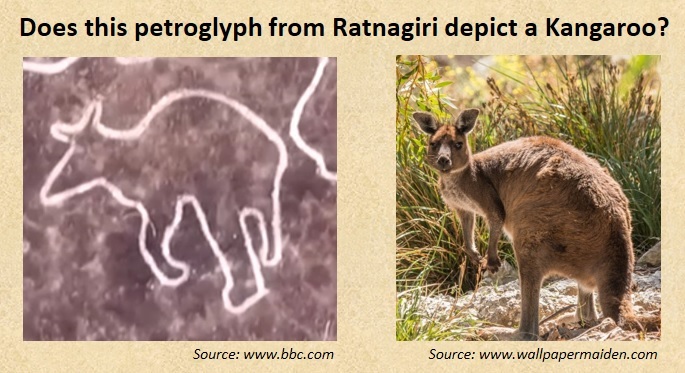 One of the mysteries of the Ratnagiri petroglyphs, which the BBC report has pointed out, is that they show animals such as the hippopotamus which is not indigenous to India. I noticed that there is at least one petroglyph that looks like a kangaroo! It is well known that the kangaroo is indigenous to Australia, and is not found anywhere else in the world. This begs the question as to how the people living here depicted animals that are not indigenous to India. Did these people have oceanic contact with Africa and Australia? Could it be that the hippo and the kangaroo were found in India 12,000 years ago? Or could there be some other explanation for this anomaly? It is at times like these that we should pay more attention to the legends of our ancestors. Tamil traditions tell us of an antediluvian island-continent called Kumari Kandam that once existed in the Indian Ocean. However, at the end of the Golden Age, Kumari Kandam was “swallowed by the sea,” and large tracts of the island-continent were lost to the ocean. N. Mahalingam, the Chairman of the International Association of Tamil Studies, has dated this inundation to c.9564 BCE.15 This is very close to the end of the Younger Dryas epoch which ravaged our planet for an extended period from c. 10,900 BCE – c. 9600 BCE. Is it possible that the ecosphere of Kumari Kandam supported animals such as hippos and kangaroos, and when the island sank under the ocean, some of its inhabitants settled on the western coast of India and etched memories of their erstwhile homeland and sacred symbols onto these flat, rocky, hilltops? More petroglyphs were discovered in 2002, in the Sindhudurg district of Maharashtra, roughly 50 km south of the petroglyph sites of Rajapur. From the photographs published in The Metrognome, I could identify two petroglyphs that bear a striking resemblance to well-known symbols of antiquity. 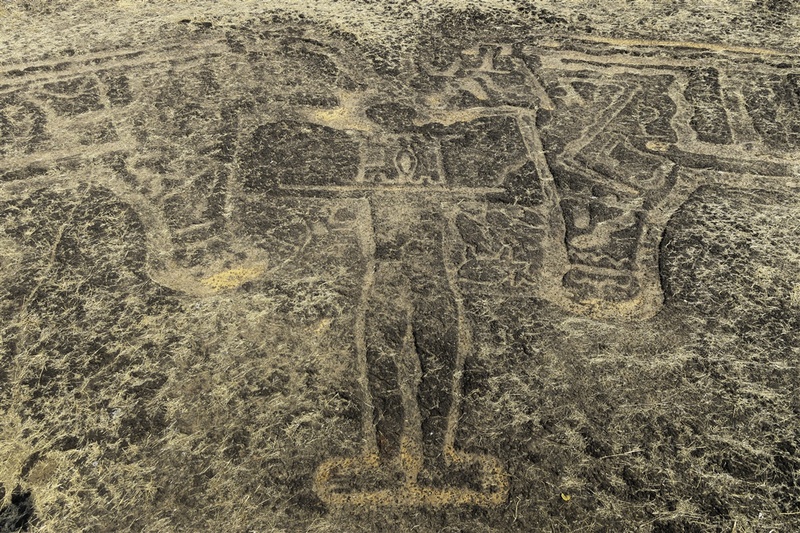 One of the petroglyphs resembles the Imperial Eagle symbol, which has served as an insignia of royalty and has been displayed on the coat of arms of many nations throughout history. The Aquila or eagle was a prominent symbol in ancient Rome and was used as the Roman Legion Standard. It probably derives from the Aetos Dios – the giant, golden eagle that served as Zeus’s personal messenger and animal companion.17 In Egypt, the falcon was the bird-form of the solar god Horus, and it was depicted with outstretched wings above the head of the pharaoh, conferring him with divine protection.18 The eagle continues to be displayed on the coat of arms of many European nations, including Germany, Poland and Romania. In India and the countries of South-east Asia, the solar bird Garuda was the eagle-mount of Lord Vishnu, the supreme deity associated with the preservation of the created order. Garuda has been used as a symbol of royalty for centuries, and continues to be used as a martial motif by the armed forces of India and as a national emblem of Indonesia and Thailand. 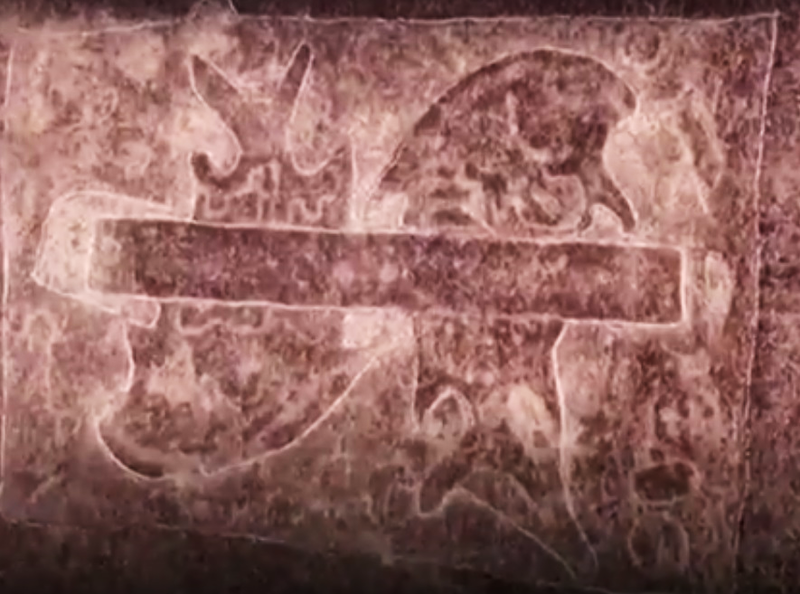 The oldest known depiction of the Andean Staff God was found in 2003 on some broken gourd fragments dated to c.2250 BCE,21 meaning that this Sindhudurg petroglyph predates the earliest known depiction of the Staff God by thousands of years. Evidently, the petroglyphs of the Konkan region of Maharashtra, stretching from Ratnagiri in the north to Sindhudurg in the south, contain some of the earliest depictions of the sacred symbols used by cultures across the ancient and modern worlds. This pushes back the date for the beginnings of astrological lore and sacred symbolisms to the remote period of c.10,000 BCE, when humanity had just emerged from the terrible cataclysms of the Younger Dryas epoch. This raises the possibility that the Konkan belt was a place where survivors of an advanced Ice-Age civilisation settled and etched their sacred wisdom onto the rocky landscapes. More research must be undertaken to ascertain if and why the petroglyphs resemble hippos and kangaroos. Due to the far-reaching implications of these symbols, the dating of the petroglyphs to the period of around 10,000 BCE is bound to come under scrutiny. More studies employing different scientific dating techniques such as radiocarbon dating, and thermoluminescence dating must be undertaken on the petroglyphs. This analysis is based on a small sample of petroglyph images contained in the BBC report and a video on the BBC News Marathi TV Channel. The hundreds of petroglyphs found in the Ratnagiri and Rajapur area must be studied with a view to identifying correlations with sacred symbols across various ancient cultures. There is no doubt that this is an extremely significant discovery which can fundamentally alter our current perceptions about the origins of sacred symbols and astrological lore. 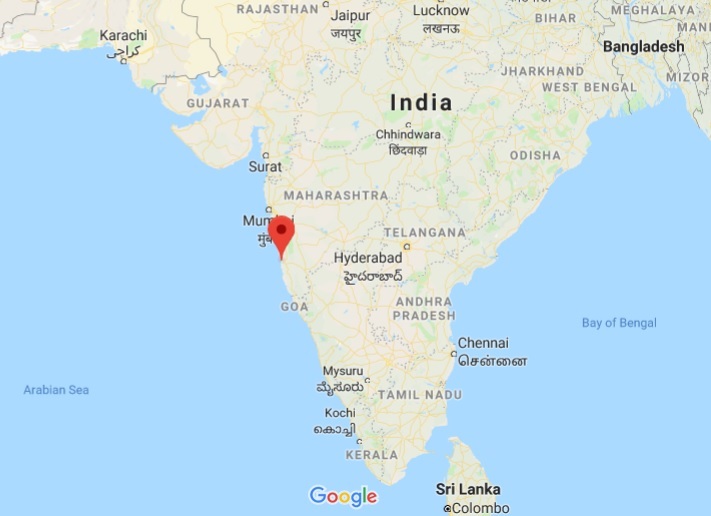 1 “Prehistoric art hints at lost Indian civilization,” BBC News (1 Oct. 2018). 2 Jayant Sriram, “The petroglyphs of Ratnagiri,” The Hindu (20 Oct. 2018). 4 “Konkan Petroglyphs: Mystery of 10,000 year old signs,” BBC News Marathi (17 Sep. 2018). 5 George Hart, The Routledge Dictionary of Egyptian Gods and Goddesses (Psychology Press, 2005), 84. 6 Lorna Oakes and Luca Gahlin, Ancient Egypt (Anness Publishing Ltd, 2002), 287. 7 Firestone RB, West A, Kennett JP; et al., “Evidence for an extraterrestrial impact 12,900 years ago that contributed to the megafaunal extinctions and the Younger Dryas cooling”. Proc. Nat. Acad. Sci. U.S.A. 104 (41), October 2007: 16016–21. 8 “Danish Arctic research dates Ice Age,” Politiken.dk (11 Dec. 2008). 9 Irene Winter, Hasanlu Special Studies, Volume I: A Decorated Breastplate from Hasanlu, Iran (UPenn Museum of Archaeology, 1980), 11. 11 David John, “Mistress of Animals,” My Favourite Planet. 12 Jonathan Mark Kenoyer, “Master of Animals and Animal Masters in the Iconography of the Indus Tradition”, in The Master of Animals in Old World Iconography, ed. Derek B. Counts and Bettina Arnold (Archaeolingua Alapítvány, 2010). 13 Ariel Guttman, Gail Guttman, Kenneth Johnson, Mythic Astrology: Archetypal Powers in the Horoscope (Llewellyn Worldwide, 1993), 357. 14 Bruce McClure, “Aquarius? Here’s your constellation,” EarthSky (5 Oct. 2018). 15 Graham Hancock, Underworld – the Mysterious Origins of Civilization (Three Rivers Press, 2002). 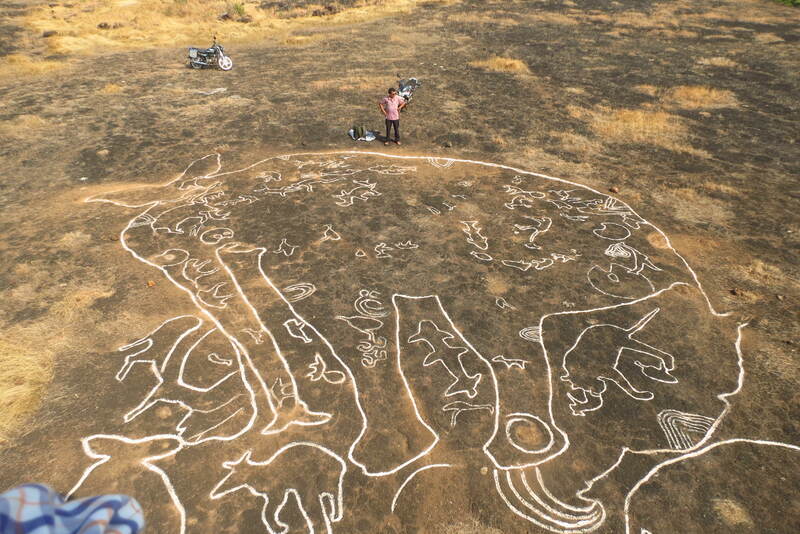 16 Vrushali Lad, “Neolithic rock art sites found in Maharashtra,” The Metrognome (2012). 18 Egyptian Art in the Age of the Pyramids (Metropolitan Museum of Art, 1999), 318. 19 “Scientists find America’s oldest image of a deity,” Eurekalert.org (14 Apr. 2003). 20 “Viracocha,” Ancient History Encyclopedia. Bibhu, thank you for these pavement engravings. There are similar works near lakes in Russia, and coastal Australia; and on vertical surfaces in coastal Korea. There may be an Indian tradition of infill ‘tattoos’ on elephant bodies, I vaguely recall seeing one example. Dating has to be tentative.